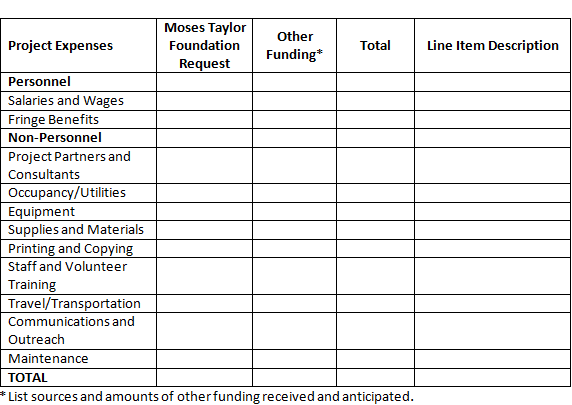 The Moses Taylor Foundation Quarterly Grant Application includes the following four components: Organizational Profile & Executive Summary, Proposal Narrative, Budget Narrative, and Required Attachments. Applicants must submit a complete proposal by the deadline date and time to be considered for funding. Discretionary Grant Proposals (up to $20,000) require only the Organizational Profile & Executive Summary and Budget Narrative. Please feel free to contact the Foundation’s Program Officer, Jeff Smith at jsmith@mosestaylorfoundation.org with any questions regarding proposal submission. Upon receipt, applicants will receive email confirmation. Describe your organization – its history, primary activities, populations served and recent accomplishments. Describe the purpose of the project and the need or problem it is intended to address. Discuss your organization’s capacity to undertake the project and the capacity of key partners, if relevant. Outline the planned project activities and timeline. Detail anticipated goals and outcomes and how they will be measured. Using the general format provided, outline all costs related to the grant request. Adjust line items as needed to reflect actual project budget. The following attachments must be submitted in Adobe Acrobat, Microsoft Word or Microsoft Excel format. Other formats will not be accepted.